Yeah, right... As repeatedly illustrated on the Better Bibles Blog or in a helpful post like this, there is no such thing as one, best English Bible translation. One must always keep in mind intention and audience when evaluating versions. I do, however, have a few questions that help me sort out which versions I prefer and use. I explain things more fully HERE and provide some specific examples, but here's the summary with some reflections. What original language text is being used? For the Old Testament, I at least start with the Masoretic text as provided by something like the BHS (or forthcoming BHQ). Text critical issues are something of a factor, but the bigger issue is--at least for Christians--the relation of the Hebrew to its translation in the Greek Septuagint (or other early Greek versions). Yes, the Greek Bible was the Scripture for the early Christians, and yes, it is indispensable for understanding some of the NT uses of Scripture, but my English translation should be based on the Hebrew. 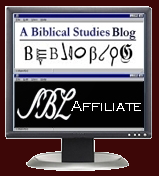 It is my responsibility, then, to see how the Hebrew Scripture is being interpreted in the Septuagint and by the early Christians and to determine how it all fits together. As for the NT, I am aware of all the issues involved, but I end up wanting an English version based on the eclectic, reconstructed Greek rather than the Textus Receptus. I still want to know what the TR reads, but I treat it as part of the history of Xn interpretation of the text. Who is doing the translating? Committee or individual? Explicitly Christian or denominational or ecumenical? Personally, I want a 'flat' reading that requires me (rather than decides for me) what is going on theologically in a text. I want to see what others are doing with the text, but for a base text, give me a ecumenical, committee edited translation. What is the translation philosophy? This is the hardest to define and is most related to the occasion. I like to have a sense of what is going on in the underlying Greek/Hebrew, but whereas more literal may be more helpful for study, a somewhat more dynamic translation is better for reading. For a base text, I want something in the middle. I can also add that inclusive language awareness is important for me. Yes, it can cause all sorts of awkward grammatical gymnastics, and I dislike the switches from singulars to generic plurals, but for a general purpose translation that would be read in church, I think inclusive language is important. What is the intended audience? Here is another example of why one version doesn't work for all. I would recommend different versions for a young child, for public reading in a congregation, or for adult Bible study. Students need a range of English Bible translations. For a more literal translation, use the NASB. For a more balanced translation, use the NRSV (or the TNIV or REB). For a more dynamic translation, use the GNT=TEV or NLT or CEV or The Message. Because of its venerable tradition and familiar wording and because its underlying Greek New Testament uses the Majority Text, use the KJV. For its useful text notes, use the NET. Recommended but not required: For insight into what the Latin Vulgate renders, use the Douay-Rheims translation. I actually use all these and more (e.g., NIV, NJB, God'sWord, ESV...), but nothing beats engagement with the original language texts themselves. My English translation should help me read those texts, but it should also leave me with the challenging of interpreting the text. I read a similar post recently by Dan Wallace. Though not speaking to the exact topic you are, it is similar. Like you, he offers "criteria" for his reasoned view. "NET, NIV, ESV: A Brief Historical Comparison"
I keep seeing the "Message" bible showing up in lists like these and i can't imagine why? The "Message" bible doesn't fit your criteria; i.e. it's not "committee translated" but translated by a lone person. Also, I just don't believe that you're unaware of it's....shall we say very "loose" translation of many verses? Please don't take this as an attack...it's not meant to be. Can you comment on these points? Matt 5.48: Quite appropriately, most versions translate teleios with "perfect" (but it really has a much larger range of meaning). I suspect most readers cruise right through that verse without much thought about what exactly this "perfect" is about. Look what Peterson does: "In a word, what I'm saying is, Grow up. You're kingdom subjects. Now live like it. Live out your God-created identity. Live generously and graciously toward others, the way God lives toward you." That is quite a free translation! BUT it also makes the reader reflect on what sort of perfection Jesus might be talking about. Romans 1.16f: A fascinating text with lots of ways of understanding Paul's words. Most English versions translate rather literally, but in doing so they often mess up what I think is the key, Paul's citation of Hab 2.4. Is it: "The righteous... will live by faith" OR "The righteous by faith... will live"? Most readers would never notice the issues involved, unless they compared the usual translations with The Message. "The person in right standing before God by trusting him really lives." I have disagreements with many of Peterson's renderings, but he is a great partner in thinking about the text.